Gas prices have taken a tumble in recent days as the fall driving season sets in and concerns about the situation in Syria have been met with potential détente, and further supplanted by worries about a possible government shutdown October 1. The average price of a gallon of unleaded gas fell by more than a nickel during the past week, according to the latest survey from the U.S. Energy Information Administration. The EIA’s weekly report shows the biggest drop in gas prices came in the Central and Lower Atlantic states, where prices were down by about 8¢ per gallon. The lowest price declines were found on the West Coast, where the average cost of a gallon of gas was flat. In some areas, the cost of gas did edge downward about a penny. For truckers and drivers of other diesel cars, the price of fuel was also down. The average price of diesel fuel was off by about 3¢ per gallon during the past week, although prices in the Rocky Mountain region were up slightly. Drivers across the West Coast enjoyed a bigger price break, with diesel prices declining about 4¢ per gallon. 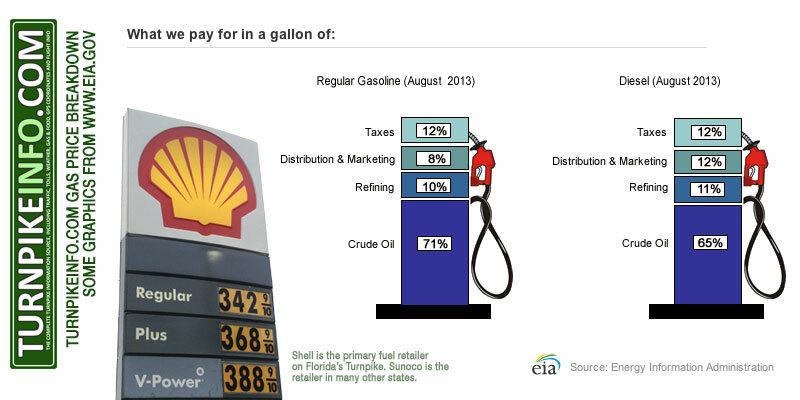 EIA’s monthly gas price breakdown shows how much is spent for crude, refining, advertising and taxes. The reduction in tensions over Syria’s use of chemical weapons has helped futures markets recover from a spike in prices a few weeks ago, which contributed to investors’ fears about possible supply shortages. Additional worries about refinery capacity in Libya and Iraq have been assuaged by new evidence of rising oil supplies from those regions. Even so, oil futures for November delivery spiked late in the day Tuesday after weak trading through most of the day. However, futures prices were well short of their August highs, when the two month delivery price for Brent was up to about $117 per barrel. Currently, the price is about $108 per barrel. U.S. crude oil, also known as West Texas Intermediate, has been falling for the past several sessions and could close below $100 within a week, if current declines persists. 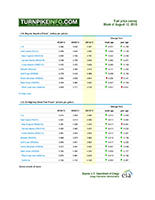 WTI peaked at the beginning of September, at $109.23 per barrel on September 6. WTI closed Tuesday at $103.37.